The Just Between Friends Sale happens in my town (and a town near you - look on their website!) twice a year. There's a Fall sale and a Spring sale. When Gavin and Brian were little, I was so grateful for these sales. I was constantly buying and selling toys so I could keep the playroom exciting and interesting and motivating. Gavin received his therapy in our home and they would use his own toys during sessions. I also routinely rearranged the room - encouraging him to go look for his favorites in new places. I was always wanting to motivate him to move his body on his own. Being able to purchase so many toys (some were brand new or looked brand new!) for MUCH less than retail was a HUGE help. Most sales I would sell a ton and buy a ton - pretty much breaking even. It was like trading! I have been hooked (and devoted) to this particular JBF sale for years. At my very first sale, I bought a baby walker that looked brand new for less than $20.00. My intention was to put Gavin in it (he was maybe 2 at the time?) to see if he would try to move himself forward. It worked! Gavin took his very first "steps" in this walker from a JBF sale. I love writing posts after each sale to share my fun bargains - and this time is no exception. I found some awesome toys and clothes for Brian and Hope! The last two sales have been a bit of a bummer (understatement of the day) because I have such an emotional memory of searching for toys for Gavin. But on the flip side - shopping for girly things is so new for me and... kind of fun! ...and racks and racks and rows and rows of clothes. This long row is just 6 month girls, if you can believe that. Each of these items were FIVE dollars! 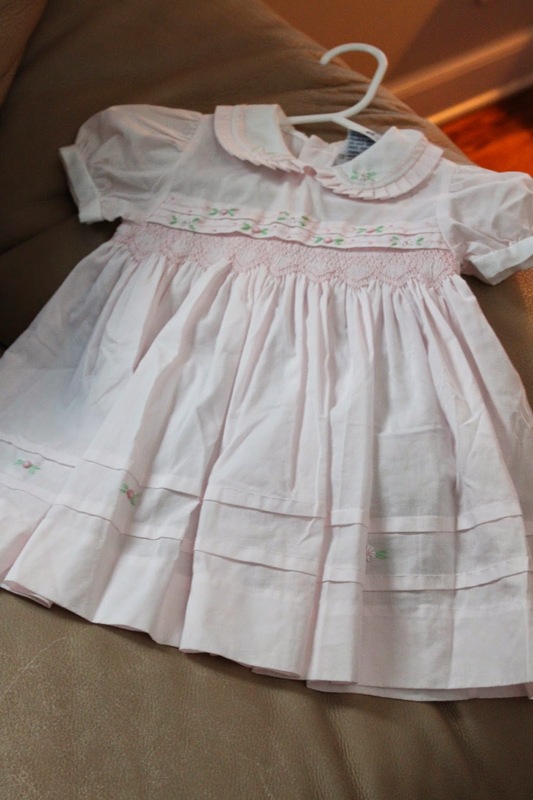 A beautiful cotton Ralph Lauren dress with matching bloomers. 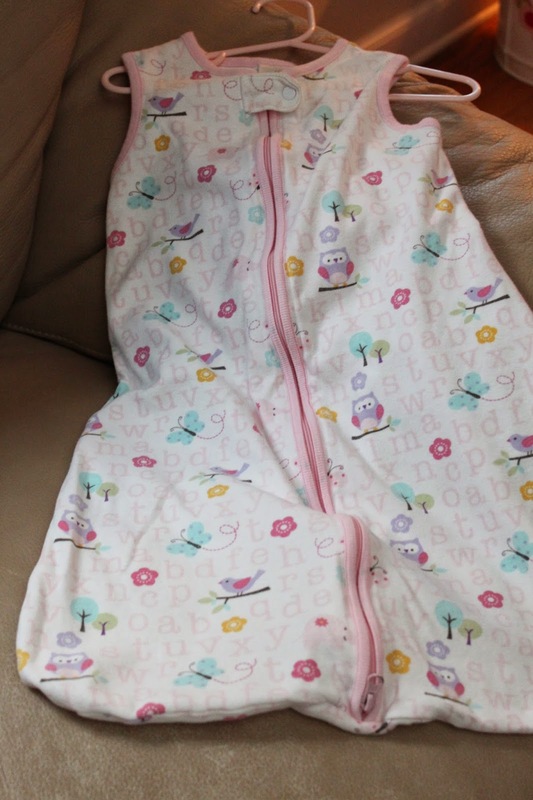 I love these things - I got two of these "wearable blankets" for Hope to sleep in. 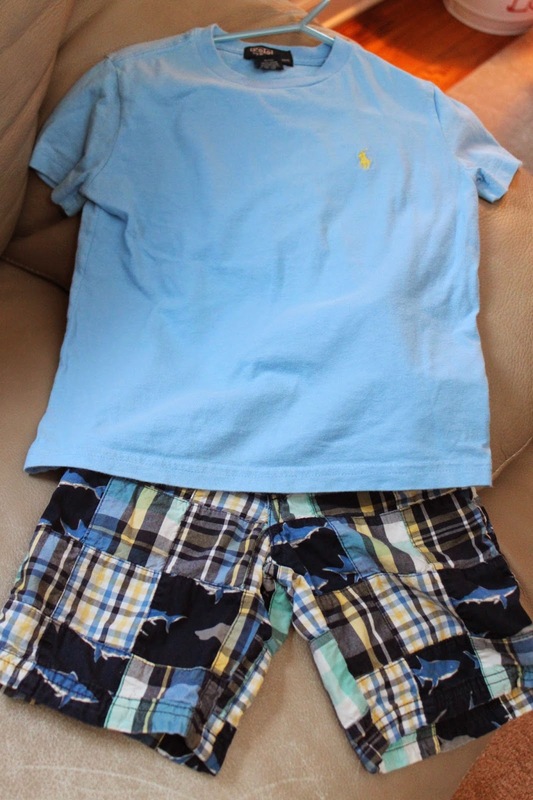 A blue Ralph Lauren t-shirt and a preppy pair of Gymboree shorts for Brian. I'm no "fashionista," but I'm pretty sure this makes a really handsome outfit for ten bucks! This is probably my favorite item for Hope - a gorgeous, perfect, old fashioned smock dress. Honestly, this looks like something my Mom would have put on me. I love it so much and hope it fits her this Saturday for her cousin's First Communion! 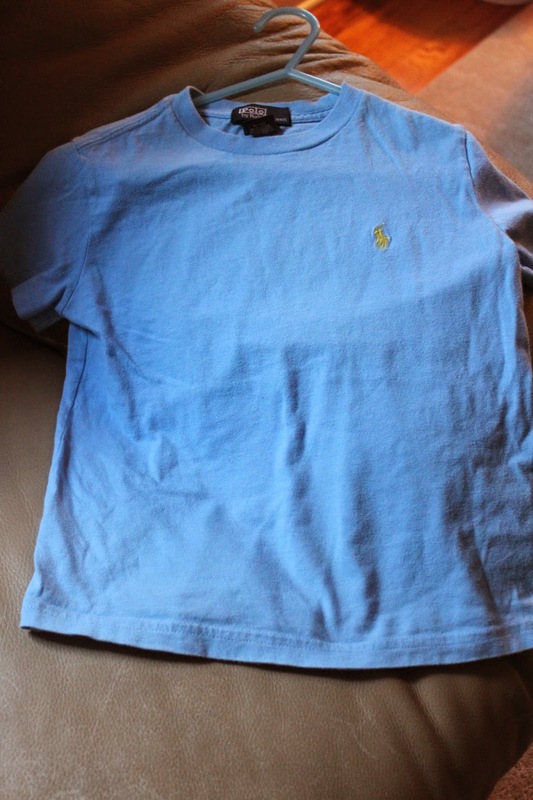 And another Ralph Lauren shirt. Five bucks, people!!! I use these cubicles and fabric drawers in the playroom to hide toys and diapers and burp cloths and they're pricey!! I was just thinking that I needed to get a bigger one to hide more toys and I tripped over this at the sale - jackpot! This entire system with the drawers was $40.00! We are ready for pool and ocean season. I got a float with a canopy for Hope... and a kickboard and boogie board for Brian. He was STOKED. All three cost me less than ten dollars. Brian is having a love affair with Imaginext toys and I love to listen to him make up scenarios with all the different people. This "Ninja Castle" set was brand new in the box for $20. It normally sells for $45! My favorite item for Brian, though, was this awesome Lego Table. I wanted to get one for his room so he can keep them tucked away from his little sister who already likes to put everything in her mouth. I can just see it now when she starts crawling. Another reason why I'm happy to have things hidden in those fabric drawers! Brian is so excited to have this fun table. He's getting so good at creating Lego masterpieces! The table was $25.00. 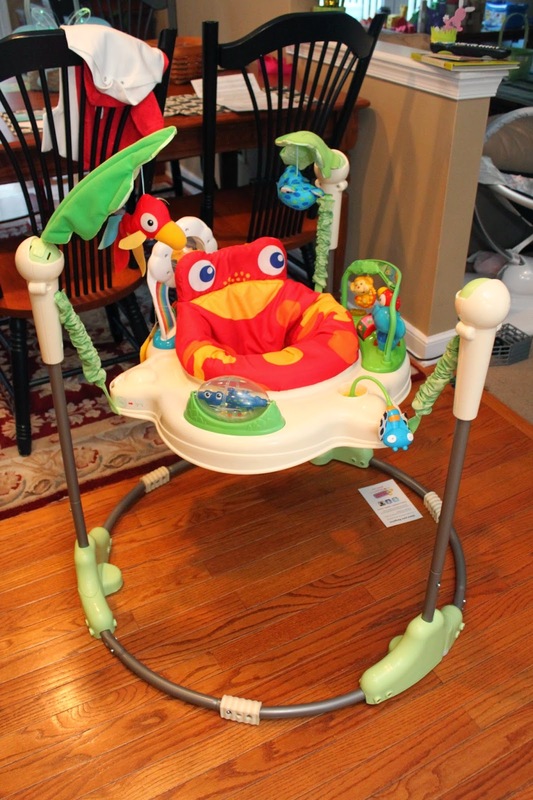 But my greatest deal of the day - and maybe the year - was this Fisher Price Rainforest Jumparoo. 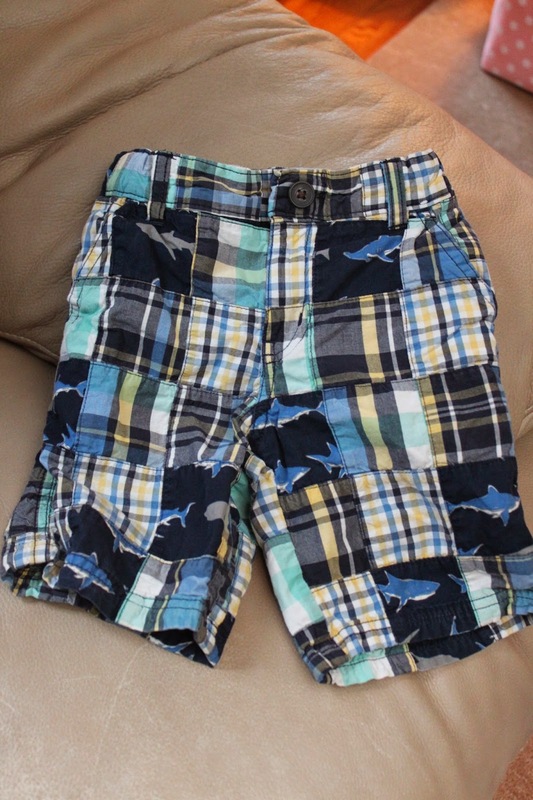 The same one that I had for Gavin and Brian as babies. It is in PERFECT (and I mean not a scratch or stain to see) condition. I paid... wait for it... you won't believe it... FOURTEEN BUCKS!!! If the person who sold this is reading (consigner W-826!) - THANK YOU so much. It is so sentimental to have the same Jumparoo that we had for the boys back in our house for Hope. Gavin was older when I was finally able to put him in it because of his low tone. But when he did finally use it, it was a great way to strengthen his legs! Not to mention, he loved to spin things and there are two great spin toys on it. Watching Hope in this Jumparoo will make me so happy. I could go on and on and show you all the other great bargains I found, but I'd be wasting your time if you live nearby. You really should get packed up and head over today. The sale opened to the public this morning (Thursday, April 24th) - and if you go on Saturday things will be 50% off (a great time to shop for clothes). It's at the Expo center - the same place I held Gavin's Playground Project! I love this sale so much - can you tell? For this girl who hates to shop (and I really do) - I make a twice a year exception for this sale! It's so much fun. I was sorta disappointed with this years sale. I did walk away with a few good deals but not as much as I had before. Thank you so much for sharing your great finds. I have found a JBF location relatively close by, and YAY...it's coming up in just a couple of weeks. I'm looking forward to finding some great deals. I remember when this sale first started, it was so small, now it's huge! This is my first year being a consignor, so far I'm pleasantly surprised at how well I did after just the presale! I'm a big fan of mom to mom sales in Ohio. It is amazing that I can drop $100 so easy but walk away with more than $400 worth of stuff. And you are right, it is just too big to capture with pictures. I wish we had these sales!! How amazing! We have the same jumperoo at work - I love it! In Australia, we call the wearable blankets "sleeping bags" & they sell for a good $50-$80 - you got a bargain!! Thank you for holding the door for me at the sale with my baby and stroller! From a distance I was admiring your baby wearing skills with your friend but then saw it was you! I still would love to learn how you situated Hope so perfectly! Can we all say, Christmas in April! lol Congrats on the great finds. I love a consignment sale near us at a Methodist church. I love that that profits go to the church. Things are SUPER cheap, I mean I get dresses for $1, pants for 50 cents, etc. 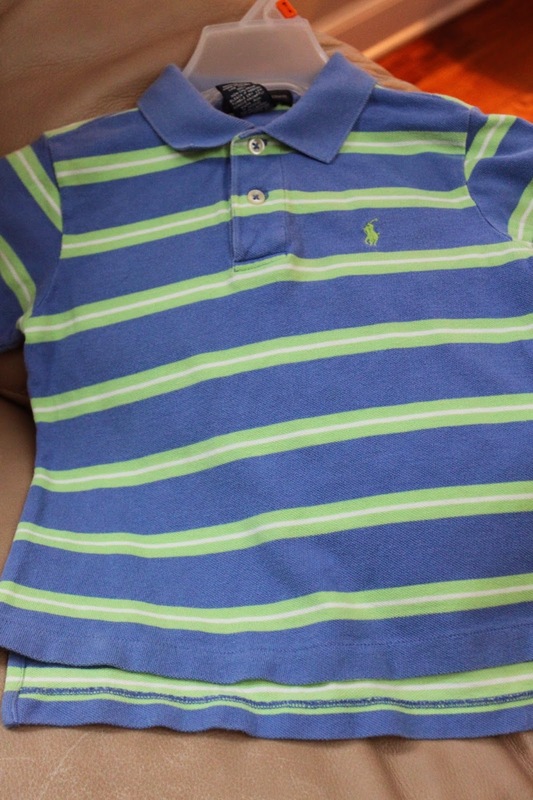 I got Gymboree, Gap, Mini Boden, Heartstrings, etc for those prices. I am not a huge shopper either but I can not take paying retail for kids clothes or toys. The best deal I got happened 2 years ago. I stumbled across a brand new Fancy Nancy doll for $2. It was made like an American Girl doll and the hair was so pretty. That was a birthday gift for my oldest and she still loves it now. I later found out that it was a rare edition of Fancy Nancy and worth quite a bit of money! I often find toys for my students (I am a preschool special instructor). This allows me to change things up quite a bit. I also love finding sensory or fine motor items! This year my 3 year old is in love with dresses, the fancier the better. So at a $1 each I made sure to fulfill her obsession!